Casio is one of the best watch companies ever. They produced an incredible number of watches and they still continue to innovate and come up with new products every year. In this selection, I want to bring together some of the best Casio watches that are now available on the market, mainly from the following series: Protrek, Databank, Edifice, and Ana-Digi. If you do not already know, ProTrek is a series that concentrates on toughness mainly for outdoors, similar to the G-Shock, Databank is for people who want a built-in calculator in their watch, Edifice is the equivalent of elegance and quality, and Ana-Digi is similar to Edifice but it specifically has physical hands that indicate the hour. Let’s proceed to the watches themselves and help you find the best one. 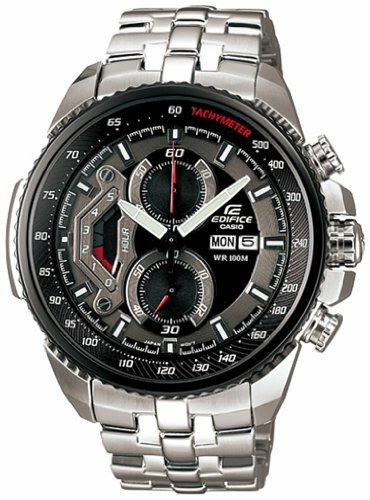 The Casio Edifice Tough Solar comes in a high quality and solid stainless steel case with mineral glass that is waterproof up to 100 meters. The mineral glass is a scratch resistant material that provides excellent viewing angles and resistance at the same time. Due to the Self-Charging technology you won’t have to worry about battery life because it takes all of its energy from the sun. Other features include a chronograph, world time, daily alarms and a full auto calendar. Speaking of the adjustment mechanisms the crown and pushers are really simple to figure out straight out of the box and are made of the same high-quality stainless steel as the rest of the casing. I know this may sound obvious but I have seen some manufacturers that use different materials for the screw down crowns or for the bezel to save material in order to deliver cheaper products. This is not the case here since we are speaking of a top-tier company that doesn’t accept compromises. For the price you get a great watch that is carefully crafted and has a lot of exciting features all wrapped up in a beautiful stainless steel case manufactured to last. 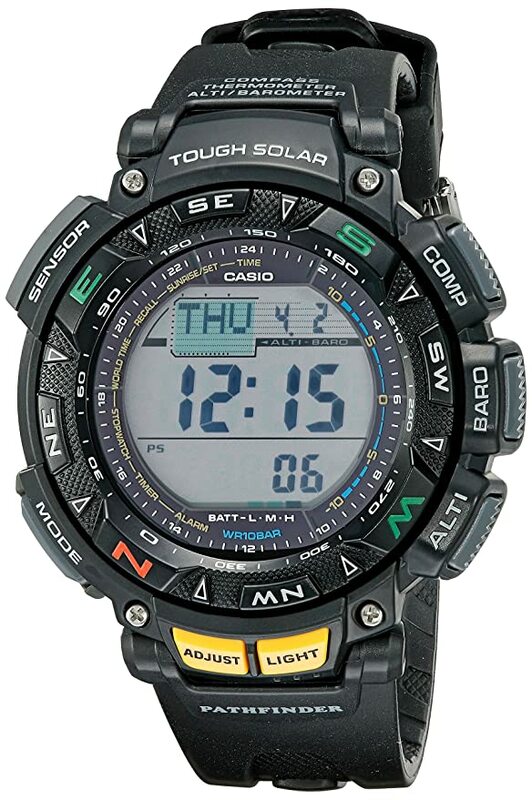 If you consider it has what it takes the Casio Edifice Tough Solar is one of the best acquisitions you can make. As said before Casio’s ProTrek is a series designed for people who want a tough watch with lots of features to get you through all of life’s challenges. This is a triple sensor Pro Trek so this means it has the famous trio composed of a Barometer, Compass and Thermometer with which you can avoid rain, guide yourself in unknown environments and check the temperature just like a meteorologist. The case is mainly made out of resin but with some parts titanium and the band is fully made of titanium which brings a plus of endurance to the table; it feels great on the hand especially due to the small winglets that swivel a little along with the bracelet in order to fit all wrist sizes. The window is made of high-quality scratch-resistant mineral glass which I consider to be a better choice than the sapphire crystal ones mainly due to the longevity of this type of material. It has a great display that is partitioned into multiple windows which show information gathered from the three sensors, date and time; it is water-resistant up to 200 meters (660 ft.) and other features include atomic timekeeping, low temperature resistance, a digital compass with bearing memory, sunrise and sunset data, world time and daily alarms. 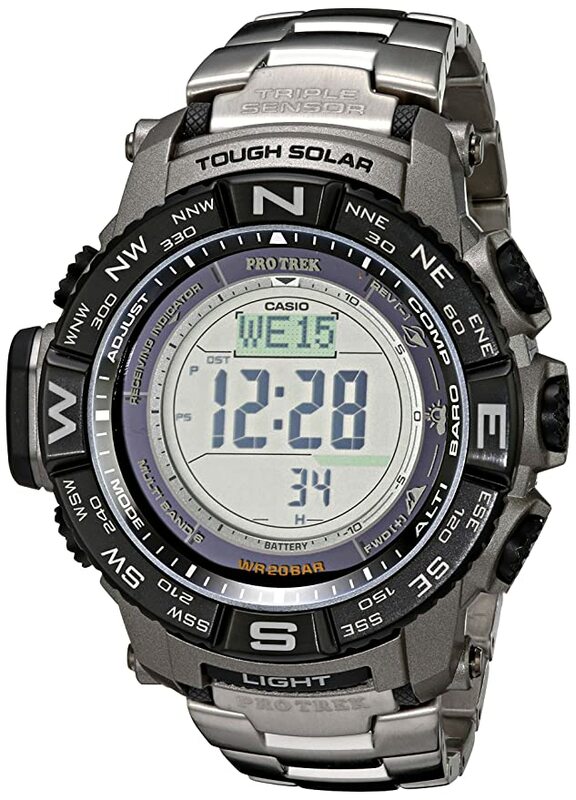 Considering all this watch has to offer, you can get a top Casio ProTrek watch for a reasonable amount of money. This is one of the watches that I highly recommend to anyone who wants a tough watch with a quality build and lots of functionalities. This is a sports watch suitable for regular people but also for the ones that take the trail less traveled alike. In a nutshell it has three main sensors, an altimeter, a barometer, a thermometer, and a water resistance of up to 300 meters, full auto EL Backlight with afterglow for good readiness in dark environments, world time, city code display (something you rarely encounter on a watch), daily alarms, 1/100 seconds stopwatch and more importantly solar charging capabilities with a battery that can resist 6 months on a full charge until next time it sees the sunlight. Now I will speak of some features that caught my attention from the start. The compass is a very nice feature and it indicates all four cardinal points (north is indicated by 3 stripes), the rotating bezel is very fluid in rotation and it is tightly secured to the face. The screen is very crisp and pleasurable to the eye unless you try to look from extreme angles because in this case it becomes unreadable. The sunrise/sunset feature is nice but is not something I often use, and finally, the alarm is loud because it uses a high pitch noise. These are the features that caught my eye most along with the build quality which is very good and makes it a pleasure to wear it at all times. The single and most frustrating thing about this watch even if this is a pretty small thing, is the timer which can only be set for hours and minutes, not seconds. I don’t know why this decision has been taken but it is kind of annoying when you want to set your timer for small periods of time. That’s pretty much it, of course I could not cover everything this watch is capable of, but you can grasp the main idea. It is a sports watch with a beautiful design and lots of features coming at a great price, it is a good pick for people who want a compromise between quality and price too. 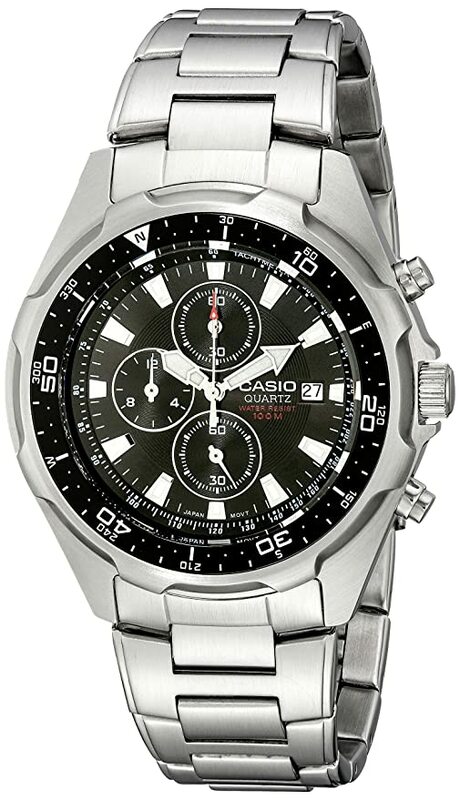 The Casio Men’s AMW330D brings together excellence, reliability and a low price in a high quality stainless steel casing. The display is pretty simplistic compared to other Casio watches; it basically features luminous hands, 3 dial indexes and a small date window all on a black background. It comes with a 100-meter water resistance that makes it suitable for activities at the surface of the water like snorkeling or swimming and the protective mineral crystal window assures that scratches and small shocks won’t be a problem in the long run. Speaking of the materials and casing in general, it has a 46.2-millimeter case and a stainless steel band which are suitable as said above for both surface diving and comfortable all-day wear. Generally speaking, this is a somewhat big watch and is recommended that your waist is similar. Now the icing on the cake really is the tachymeter and chronograph. The tachymeter can be used to determine the speed and the chronograph is basically a stopwatch for diving. The large second hand is used for the top and center chronograph providing the 60 minute / 12-hour counters. Besides these, what I consider being pity about this watch is the crown which doesn’t seem to be a screw down type. So you can’t actually use this watch for any serious diving. I am aware that Casio says it is only good for surface diving but a screw down crown would have been so much better. Of course with the lower price comes more compromises but at the end you get a stainless steel watch with a lots of features to be excited of. 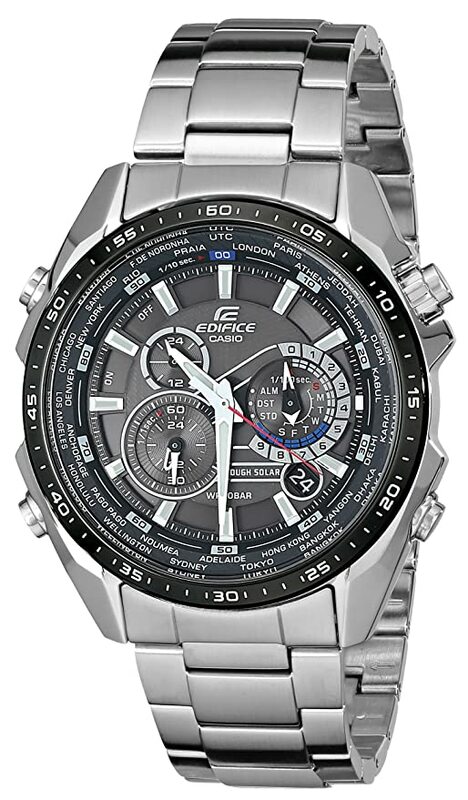 The Casio Edifice EF558D is an excellent example of how great the Edifice series is. It includes many great features like a tachymeter, stop watch, chronograph and timer, all wrapped up in a high quality 49mm stainless steel case with a mineral crystal window which is scratch resistant powered by a quartz movement mechanism. It features blue luminous hands and hour markers that let you read the hour in dark environments. Although this type of paint is not as visible as others I am a big fan of its color in particular. Now some words about the features listed above. The tachymeter is the scale around the rim and can be used to compute speed based on travel time or to measure the distance based on your speed. The chronograph is basically a stop watch especially used for diving to help you know for how long you’ve been underwater, although I would not consider using this specific Edifice watch for professional diving since it only has a water resistance of up to 100 meter or 330 feet. For the price, you can’t get it any better. You basically get a sleek and subtle design that gives the watch an unmatched sense of luxury and a handful of features for a little over one hundred bucks. Throughout all Edifice watches, I consider this to be the best buy. The calculator only has the basic operations, but I consider them to be enough as more operations would make the buttons too small to push. It features a backlight that lets you use it during nighttime or in dark conditions a calendar, and a stopwatch. The case has a diameter of 33mm and a thickness of 9mm with a buckle clasp closure and weighs a total of 1.76 ounces making it suitable for all sorts of clothes. I really like the currency conversion feature and the snooze alarm which lets you switch modes and still see the current time below it. This can give you an idea of how Casio is concentrating on details even on cheaper products. 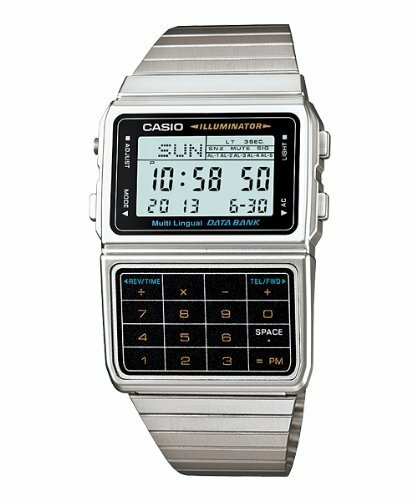 If you find yourself working with calculations all day the Casio Silver Tone Memory Calculator Databank might just be the perfect choice for you, and at this price, it is a bargain.